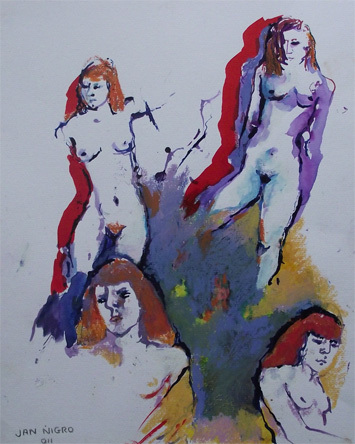 Jan Nigro Redheads, 2011, Ink & pastel on paper, 50.6 x 40.5 cm. Ron Brownson, senior curator in New Zealand and Pacific Art at Auckland Art Gallery described Jan Nigro as “a living hero…She has a huge heart for the truths within other’s lives. 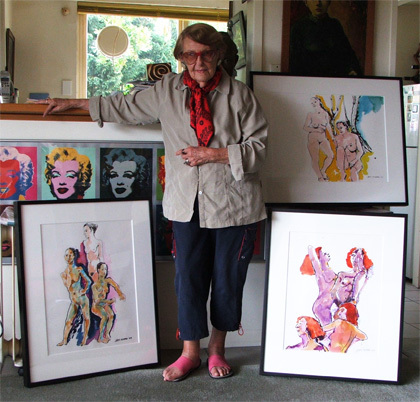 I consider Jan to be one of New Zealand’s bravest and insightful artists." Born in Gisborne in 1920, Jan Nigro enrolled at Elam, School of Fine Arts, Auckland in 1937 and studied under the tutelage of Archie Fisher, John Weeks and Lois White. It was here that she met her future husband, the artist, Gerry (Angelo) Nigro. After the war they moved to Australia where Nigro became established as an Australian artist exhibiting in both Melbourne and Sydney. On their return to New Zealand they settled in Rotorua where Jan Nigro explored abstraction before returning to the figure; which was a source of inspiration across her over 70 year career. From Rotorua they moved to Auckland settling first in Northcote and then Waiheke Island, where she lived for 25 years before moving to Takapuna. In 1996 Claire Finlayson wrote her thesis on Jan Nigro, and entitled it "Jan Nigro - Topographer of the Social". In it Finlayson discussed how in the first two and a half decades of the artist's career Jan Nigro submitted the figure to a “formal analysis” and how since then she had "undertaken to examine the figure from a range of sexual, social, cultural and psychological perspectives". Jan Nigro was an astute observer of human behaviour, succinctly appraising the world around her in her search to understand the figure. The human figure remained constant for her as the greatest and most lasting source of inspiration. She liked to build a strong rapport with her models and built themes around them. They were portraits only in the sense that we could often identify the sitter. Primarily Jan Nigro used the figure as a means to represent the themes and subjects, which she chose to explore. In 1993 she was awarded an MBE for Services to the Arts. In 1996 David Bateman Ltd published her autobiography an "Apple for the Teacher". During 2001-2002 a survey of her work - A Portrait of Jan Nigro - toured to the National Portrait Gallery, Wellington and the Rotorua Museum of Art & History. Jan Nigro for many years met weekly with fellow artists to draw and be inspired by the models who sat for the group. She always looked to challenge herself be it by medium or in the interpretation of subject. Aware of the trends of her time Jan Nigro was interested in how society adapted to issues. In her artrwork she was always looking to innovative and throughout her career was prepared to explore and tackle difficult subjects and experiment with her mediums. Jan Nigro is represented in many private and public collections both in New Zealand and internationally; including Te Papa Tongarewa, Auckland Art Gallery, Rotorua Museum of Art & History, The Dowse, Hawke’s Bay Museum, National Gallery of Victoria, Melbourne. Click here to read Ron Brownson's tribute to Jan Nigro. 2012.